In 2016 the Nellis Air Force Base annual open house and air show took place on November 12-13. Michael Cleaver delivers his report on the "75 Years of Airpower" show, all photos by author. This year’s edition of the annual Nellis AFB Open House, or Aviation Nation as it is more popularly known, featured two main themes as part of the celebrations for the base’s 75th anniversary – heritage from the past and capability of the present. 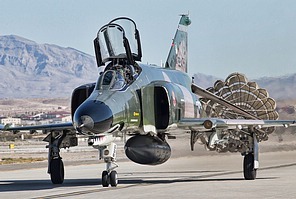 Sadly it was also the last time that examples of the remaining QF-4 would be seen in the air at a large public airshow. Located North East of Las Vegas the show can attract up to 200,000 visitors over the weekend. This year it was held on the 12th-13th November under the banner “75 Years of Airpower”. Nellis AFB was originally a very small operation called McCarran Field and in 1929 it was just a small dirt airfield serving local carrier Western Air Express. This sparsely populated open desert area was then procured in early 1941 by the city of Las Vegas (then pop 9000), and shortly thereafter leased to the US Army Air Corps (USAAC), the forerunner to the United States Air Force (USAF), for the purposes of gunnery practice and named the Las Vegas Army Air Field (LVAAF). The crews of bombers, mostly B-10, and later B-17, and B-24s, preparing for action in WWII trained here. 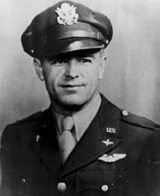 It was not until April 30, 1950, that the facility was named Nellis Air Force Base, after the late 1st Lt. William Harrell Nellis who, as a member of the 513th Fighter Squadron and while flying in his P-47, was shot down attacking a German convoy over Luxembourg. He was 28 and had 69 missions to his credit. Nellis AFB has more squadrons than any other USAF base and the USAF Warfare Center (USAFWC) oversees the operations of the 99th Air Base Wing, 57th Wing, the Nevada Test and Training Range, 53rd Wing (at Eglin AFB), 505th Wing (at Hurlburt Field), and the 926th Wing, as well as many tenant organizations. Nellis AFB is best known for the realistic air to air war games of the Red Flag exercise which began over forty years ago in November 1975, and was established after the Vietnam War where aircraft and pilot losses were unacceptably high. A subsequent report (the Red Baron Report) identified inadequate training as the major cause. Thus, a simulated real world combat training program was initiated. As famous as Nellis AFB itself is the 64th Aggressor Squadron in their multi-colored jets and red stars. Aggressors are the “bad guys” that provide the US and its partners valuable experience in real air combat situations against a determined adversary. Since last year the Aggressors have been supported by A-4K/N Skyhawks from the company Draken International as part of a “commercial adversary” contract with the USAF. This move was prompted by the deactivation in March 2015 of the 65th Aggressors Squadron that flew the F-15 Eagle. The cost of just one F-15 sortie equals three to four sorties through Draken. Draken’s A-4s were purchased from the Royal New Zealand Air Force and feature system capabilities similar to the F-16 MLU. So as mentioned the 2016 open house celebrated the 75th Anniversary of the establishment base in 1941, and it was originally planned to display the MiG-29, MiG-25 and de Havilland Vampire from the Threat Training Facility, but the logistics of doing this meant that unfortunately this didn’t happen. Never mind though there were plenty of other interesting aircraft in an impressive static display of warbirds provided by the Planes of Fame museum and Commemorative Air Force (CAF), alongside military assets from both the USAF, US Navy, and other privately owned aircraft to be seen. This included QF-4 Aerial Target, B-25 Mitchell, C-5 Galaxy, B-1B Lancer, F-15 Eagle, A-10 Thunderbolt II, F-5N Tiger II, F-16 Fighting Falcon, F-22 Raptor, F-35 Lightning II, P-38 Lightning, T-33 Shooting Star, T-38 Talon, F4U Corsair, EA-18G Growler, MV-22 Osprey, HU-16 Albatross, A-4 Skyhawk, and the latest Netherlands F-35A to name a few. The flying program included two intriguing headings; the Nellis Heritage Parade and the Nellis Capabilities demonstration. Both sounded like they had potential to be exciting and as it turned out they were! The Heritage Parade included aircraft that dated back to World War II, and also the Vietnam and Korean conflicts. The display consisted of tight turns onto, parallel with, and away from the flight line providing good opportunities (sun angle dependent) for photographers. As usual, the best places for topside angles were the extremes of the crowd line, with the north end favored, as lighting was better. It was a welcome surprise to see the CAF P-63 King Cobra as this was not listed as even attending. Also taking part was the unusual PB4Y-2 Privateer, the Navy version of the B-24, and a B-25. These were the type of bombers that flew here when it was a facility for gunnery practice in the early forties. An example of a B-17 was also planned but wasn’t able to attend. Of the jet age the F-86 Sabre, T-33 Shooting Star, MiG-15 and of course the mighty QF-4E Phantom II made excellent passes. It was rumored and confirmed by pilots that an F-4 vs MiG-15 display was planned but last minute approvals were not forthcoming. The T-33 Shooting Star “Ace Maker” flown by Greg W. Colyer would return to provide some great very low passes and then race with the Jet Car accompanied by large and impressive pyrotechnics! The Nellis Capabilities display concentrated firmly on the modern era with simulated airfield air and ground attack elements. The 64th Aggressors Squadron (AGRS) F-16s provided (as might be expected) the enemy attack to get the action started and a low pass provided the opening of the air-to-air segment. With two F-16 Aggressors - one in the new splinter paint scheme - and two F-15Es already in the air, the call to “scramble the F-15s” saw two F-15D Eagle interceptors thunder along the runway to join the fight. The F-15Es and F-15Ds were from the 17th Weapons Squadron, part of the 57th Wing, and their task was to neutralize the aggressors. With so many jets, much afterburner, and regular use of flares to simulate evasive tactics, it was potluck that the camera was pointed in the right direction at the right time! Next, it was the turn of the A-10s for some ground attack that showed the manoeuvrability of the Warthog. The two ‘Hogs were from the 53rd Wing Eglin AFB and provided simulated ground attack with strafing runs and impressively timed explosions. Supporting ground troops were two HH-60G Pavehawk combat search and rescue helicopters from the 66th Rescue Squadron. All the pilots did a great job in keeping the action centered on the airfield and very visible to the large crowd. As well as the Nellis specific demonstrations, several other displays contributed to making this show as greatly enjoyable as it was. Vicky Benzing and her historic Boeing Stearman biplane built in 1940 provided an entertaining aerobatic show with low passes and providing a full aerobatic show in an Extra 300L was Chuck Coleman. The West Coast Ravens provided the sight of 24 privately owned small custom built RV aircraft in formation. Although the NASA ER-2 demonstration was cancelled just prior to the show the 10 Tanker Air Carrier (a private company) water drop demonstration with OV-10 Bronco and DC-10 was unusual too and interesting to watch. The OV-10 Bronco is employed as pathfinder to “spot” the location of the fire so that the water drop of 11,600 gallons of retardant in the tank underneath the DC-10 can be released accurately. Therefore joining the DC-10 was the OV-10B Bronco from the Cactus Air Force flying museum. The Pacific Air Forces C-17 demonstration team displayed the short landing and take-off characteristics of the C-17 Globemaster III, as well as the slow speed and manoeuvrability of the aircraft. Though a USAF base, Nellis regularly hosts US Navy assets and the VFA-122 “Flying Eagles” F/A-18F Tactical Demonstration was a reminder of what a great strike aircraft the Super Hornet is. A high energy display including minimum radius turns and high speed dedication pass made for another awesome fast jet display, alongside the always impressive F-22 Raptor. All the displays were enhanced by the scenic backdrop of the Sunset Mountains. In 2016 the F-35 Lightning II Heritage Team was formed. The U.S. Air Force Heritage Flight Program actually began in 1997 to commemorate the Air Force's 50th anniversary when Air Combat Command (ACC) approved the flight of an F-15 and two P-51 Mustangs. This proved so popular that it became a regular air show display in its own right. The program uses current military demonstration pilots and civilian warbird pilots to enable the displays to be undertaken. The current displays are based around the F-22, F-35A and F-16. However before the 2013 sequester, other aircraft such as the F-15C Eagle, F-15E Strike Eagle, F-4 Phantom II and A-10 Thunderbolt II were regularly seen participating in formation displays with warbirds from the past. The USAF Air Combat Command (ACC) Aerial Events office manages the coordination of the three current demo teams (F-22, F-35A, F-16) and the Heritage Flight program. The Air Force Heritage Flight Foundation (AFHFF) was formed in 2010 and is a non-profit organization dedicated to presenting Heritage Displays to the public and keeping the displays flying by supporting funding of them. 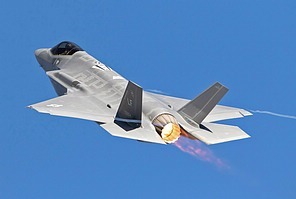 At the Nellis AFB air show the F-35A Lightning II flew with the F-22 Raptor, and F-86 Sabre. It was hoped that its namesake, the P-38 Lightning. would be able to fly but disappointingly it did not. Draken International was the sponsor for this year’s Aviation Nation and displayed on static the company’s Aermacchi MB-339CB, Aero L-159E ALCA, and Douglas A-4K Skyhawk. The services provided by Draken include threat simulation and adversary training support. They have over 70 jets and have been described as the largest private air force in the world. The argument for contracting out adversary support is cost – Draken’s aircraft are significantly cheaper to operate than their military counterparts, and there are additional savings in the reduction of flying hours on USAF’s own inventory. The USAF awarded an experimental “proof of concept” contract to Draken last year to provide support to the USAF Weapons School and the F-35A Joint Operational Test Team. The undoubted star of the show for many, two of the remaining 13 QF-4 Phantom IIs were at Nellis AFB, so that aviation fans could see them one last time. The QF-4 Full Scale Aerial Target (FSAT) flew its last unmanned mission on August 17 at Holloman AFB, New Mexico. The 82nd Aerial Target Squadron (ATRS) that operates the aircraft is based at Tyndall AFB, Florida, but has a Detachment (DET 1) located at Holloman AFB, New Mexico, and this is where all the remaining QF-4s reside. Remotely piloted the QF-4 drone has operated since 1995, but in September this year the more advanced 4th generation replacement, the QF-16, received its initial operating capability status and will be the QF-4’s replacement. 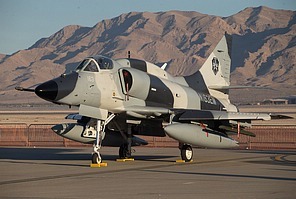 Therefore the Nellis Open House was the last airshow where a QF-4 will be seen, all that remains will be a final ceremony and final flight at Holloman AFB on the 21st of December 2016 to mark its retirement from USAF service. Lieutenant Colonel Ron ‘Elvis’ King is the detachment commander of the squadron and will be the last active pilot during the conclusion of the programme. With him was pilot Lieutenant Colonel (Ret.) Jim ‘WAM’ Harkins, each taking turns to fly the aircraft over the show weekend. Lt Col King, normally an F-16 pilot, has just achieved the 200 hours milestone flying the Phantom, while Lt Col Harkins has over 1000 hours on the type. The QF-4 used to participate in the Heritage Flight Foundation’s efforts to share air power history with the public, but since the sequestration issues and associated financial concerns this has not been possible anymore. There are 13 QF-4s left, with seven in flyable status. Sadly, most remaining aircraft are currently planned to be used as bombing targets out in the White Sands desert near Holloman AFB. The QF-4 mission has contributed enormously to the development of reliable and accurate air-to-air and surface-to-air weapon systems as well as providing practical experience for pilots from the Air Force, Navy, and National Guard, who had the opportunity to see what it is actually like to fire a live missile at a full-scale flying target. The air show was concluded by the USAF Air Demonstration Squadron, the Thunderbirds. 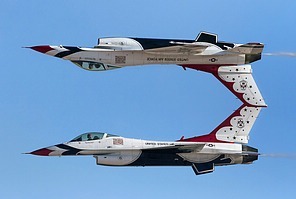 Nellis AFB is the “Home of the Thunderbirds” and it was good to the see the team back to full strength after the crash of one Thunderbird F-16 in Colorado in June. The display was as usual dynamic and exciting and the large open blue sky on Sunday allowed the full range of the display to be appreciated. Early reports indicated a record public attendance at the show perhaps as much as 300,000. Difficult lighting at times aside, there was plenty for the photographer and aviation enthusiast to be happy about, the range of aircraft from the warbirds to the 5th generation F-35A, the Nellis AFB set pieces, and of course the QF-4 Phantom II was full of opportunities. A special thank you to the 99th Air Base Wing Public Affairs at Nellis AFB for access on the media day.